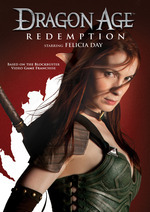 Originally airing as a limited series on Machinima.com, all six episodes of Dragon Age: Redemption are about to hit home as a collected edition DVD. Set in the same time period as the hit Role-Playing Game (RPG), Dragon Age II, DRAGON AGE: REDEMPTION stars Day as Tallis, an Elven assassin hired by the Qunari to capture a rogue mage intent on wreaking havoc throughout the world. In her quest to find this dangerous mage, Tallis is joined by other companions who are not always aligned in their beliefs and goals, but who band together to defeat their foe, in an attempt to restore peace and balance to this dark fantasy universe. Originally airing in six parts on Michinima.com, Redemption was both written and produced by Ms.Day. Fans of the game (and/or Felicia fans) might still want to pick up the DVD (when it releases this February the 14th) even if they've already checked out the full series episodically, as the disc will ship with over 40 minutes of extra's.